With the rapid demise of snail mail and the explosive double digit growth of e-Commerce, postal companies have been forced to seek new ways to expand beyond their traditional letter delivery business models. 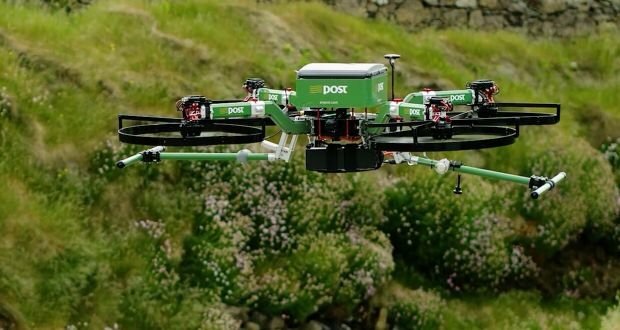 Given the online consumer’s expectation of fast parcel delivery, it is not surprising that many of these postal service companies are now turning towards delivery drone technology to remain afloat. This article focuses on the recent activities different postal companies from Australia, Switzerland, Germany, Singapore and Ukraine have undertaken as they test the feasibility and profitability of unmanned delivery drone services. Although the general consensus is that it will still take a while for unmanned aerial vehicles (UAVs) to become the defacto parcel delivery mode given a variety of existing obstacles (e.g. consumer expectations, end recipient safety, threat of theft, regulatory frameworks, battery life limitation, etc. ), the current trend does indeed point to a time where Fido won’t be able to savor the mailman’s leg. The Australia Post parcel delivery drone in action. This past April, they began conducting trials of rural drone deliveries in south-east Melbourne at Dandenong South. The use of UAVs is envisioned for rural customers given that a) they currently buy online 3x more per capita than their metropolitan counterparts, and b) for some Australians, their mailboxes are miles away from their front doors, meaning this would present a perfect opportunity for delivery drivers to remotely test pilot the drones closer to the customers’ homes from the nearest road. The trials consisted of using drones to deliver parcels to 50 locations 2x per week with the precondition that customers specifically agree to receive their parcels by drones in order to avoid any privacy concerns that might arise. The trials were backed by the Australian Civil Aviation Safety Authority (CASA) which upheld the rule that a 30 meter (98.4 feet) distance be kept at all times from all people and buildings. Currently, remotely piloted aircraft (RPA) in Australia cannot fly over populous areas as per the Civil Aviation Legislation Amendment (Part 101) Regulation 2016. Nevertheless, Australia Post has the goal of having their delivery drone experimental service online by the end of this year. Australia Post chief executive Ahmed Fahour with a parcel delivery drone. 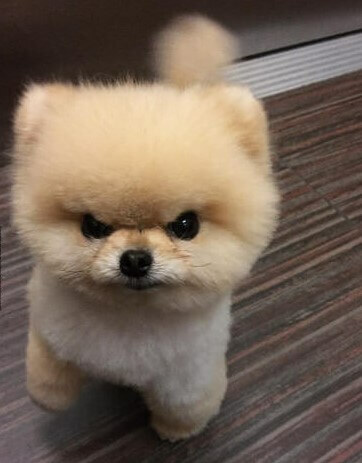 Pesky delivery drones won’t allow Fido to bite the mailman ever again. Although only 110 out 1000 Australians surveyed said they wanted drones delivering their online purchases, Australia Post is definitely banking on delivery drones becoming an everyday occurrence. To them, it is not a matter of “if”, but rather of “when”. After all, as their chief executive Ahmed Fahour says, “E-commerce and online shopping, it’s all about customer convenience”. In the meantime, before the mailman can be fully replaced, there will be a transition period and for that Australia Post envisions self-driving cars and ground drones delivering mail alongside their postal carriers. If you would like to see the Australia Post parcel drone in action, the Sydney Morning Herald has a great summary video of the Australian Post’s delivery drone program. Alternatively, the official Australia Post press release video can be found here. Max payload of 1.2 kg (2.6 lbs). Max distance 15 km (9.3 miles). Max flight time 15 to 20 minutes. Developed by ARI Labs in Melbourne (http://arilabs.com.au/). Equipped with a high-definition camera (for pilots to safely navigate hazards near their landing point), a parachute (in case of malfunction) and an alarm/warning light system which can be activated when people get too close. Enhanced with encrypted data communication for real-time monitoring by ground stations. Expected to be fully automated at a later stage once autonomous flights are approved by the Civil Aviation Safety Authority. Swiss Post parcel delivery drone. Over a 3 week period in July 2015, Swiss Post tested the use of drones for mail delivery as part of a joint venture which included Swiss WorldCargo and Matternet. Their goal? To investigate the specific uses of drone technology and examine the cost-effectiveness of logistic drones. Not just for mail/parcel delivery but also for emergency situations such as the delivery of emergency relief supplies or for high priority consignments such as laboratory samples. The 2015 trials were drone-only tests with payload tests planned for this year. The flights are expected to take off on pre-set routes authorized by the Swiss Civil Aviation Authority from Bellechasse, an airfield near Geneva used by private flyers. As Mr. Oliver Evans, current head of global business development for Matternet and former chief cargo officer with SwissWorld Cargo explained in his “Matternet in Africa” presentation at the World Cargo Symposium 2016, the benefits of unmanned cargo delivery drones are quite clear. Test flights of Matternet drones in Malawi, for example, have cut delivery times of blood samples from 18 days to just 15 minutes on certain trial routes. Swiss Post has big plans for its drones. Besides servicing e-Commerce needs, the drones might be used in combination with LoRaWAN (Long Range Wide Area Network) technology as a way to use the Internet of Things (IoT) for automatic replenishment of supplies to Swiss Post logistics customers. At this point in time, Swiss Post aims to use the drones to build up their own experience and know-how in order to get an advantage over the competition when drones do go mainstream. Given the existing regulatory framework and limited life of existing battery technology, they believe a realistic commercial use of drones would only occur by 2020. A video of the Swiss Post drones in action can be found in Reuters’ YouTube account. Swiss Post parcel delivery drone in action. How can a postal service protect its parcel delivery drones? Max payload of 1.0 kg (2.2 lbs) via small thermally insulated containers. Max distance 10 km (6.2 miles). Based on the Matternet ONE drones. Made up of 3D printed parts. Capable of autonomous, GPS-guided flight based on clearly defined, secure flight paths generated by proprietary cloud software from Mattternet. Deutsche Post DHL Parcelcopter 3.0 in action. 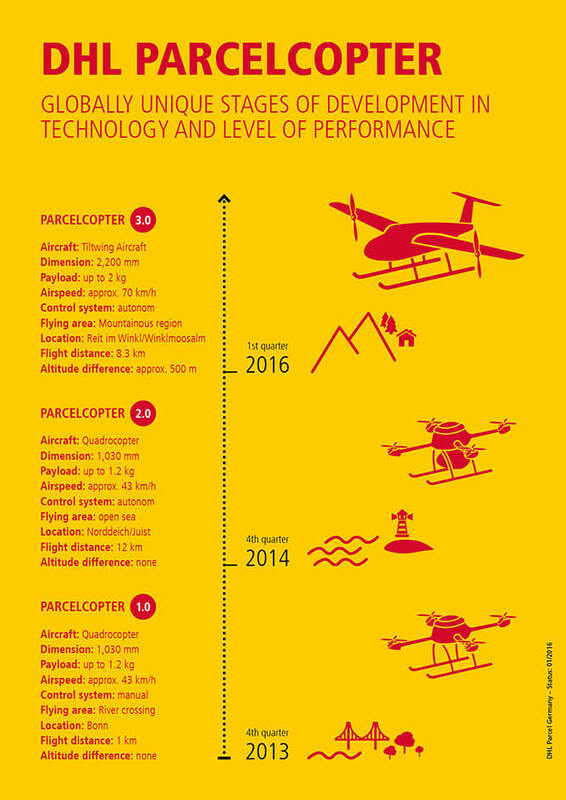 Earlier this year in the Bavarian mountains, DHL completed a 3 month test of its automated drone delivery system dubbed the Parcelcopter. Currently in its third iteration, the Parcelcopter 3.0 is a tiltwing drone that uses a Skyport (a combination mail locker/helipad that is a specially modified variation of the Deutsche Post’s existing Packstation) to automatically load and unload the drone’s payload. A total of 130 autonomous loading/unloading cycles were completed during the trial, with the drone covering 8 km (5 miles) of mountain terrain within 8 minutes of take-off. The same trip would have taken 30 minutes by car. The Skyport, which weighs 14.5 tons, measures 5 x 5 x 3.5 meters (16.4 x 16.4 x 11.5 feet) and can handle up to two drones which automatically align to a 3 x 3 meter (9.8 x 9.8 feet) landing pad. It has been described as a “small post office with a small helipad on top of it” with the entire system working automatically without human intervention. When packages are inserted, they are loaded into the Parcelcopter and approximately 2 minutes later, the roof of the Skyport opens allowing the drone to fly off to deliver its goods to their destination. The reverse is also true, making the Parcelcopter 3.0 system unique in that thanks to the Skyport it is fully designed with end customer delivery in mind. DHL Parcelcopter 3.0 and a Skyport. This version of the Parcelcopter was specially designed to fly at high altitudes, deal with fluctuating weather and temperature conditions and handle up to 500 meters (1,640 feet) differences in elevation while in flight. Previous versions faced different challenges. For example, the original Parcelcopter 1.0 (which flew in 2013) was a concept quadcopter which was manually flown 1 kilometer (0.62 miles) over a river in Bonn, Germany. The Parcelcopter 2.0 (which flew in 2014) was an enhanced quadcopter with a payload of 1.2 kg (2.6 lbs) and was capable of autonomously flying 12 kilometers (7.45 miles) over the open sea from Nordreich, Germany to the Island of Juist. According to DHL, the Parcelcopter is seen as “a tool for improving infrastructure in hard-to-reach areas as well as for improving the lives of the inhabitants there”. A can’t-be-missed video and high-quality pictures of DHL’s Parcelcopter 3.0 and Skyport can be found on DHL Deutsche Post’s website. Max payload of 2.0 kg (4.4 lbs). Max distance 8.3 km (5.2 miles). Max airspeed 70 km/hr (43.5 mph). Approximately 2,200 mm (86.6 inches) long with a wingspan of 2,000 mm (78.7 inches). Delivered packages from the German community of Reit im Winkl to a plateau located 1,200 meters (3,937 feet) above sea level. Designed as a tiltwing aircraft meaning it can vertically elevate like a helicopter and then transform to move forward like a plane, very similar to Amazon Prime’s latest design. SingPost delivery drone is based on the Pixhawk Steadidrone platform. Last October, in collaboration with the Infocomm Development Authority of Singapore (IDA), Singapore Post announced their successful trial of a drone-based point-to-point recipient-authenticated mail delivery system. 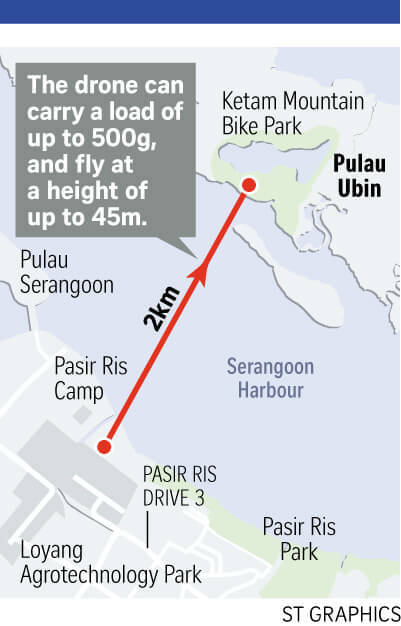 The test flight, which lasted five minutes and flew 2 kilometers (1.24 miles) between Lorong Halus and Pulau Ubin, carried a letter as well as a t-shirt over the Serangoon Harbour. What makes the SingPost delivery drone system unique is that it integrates a secure authentication system and an app for users to ensure that the package is delivered to the intended recipient. In addition, the app allows users to select their preferred delivery date and time. SingPost understands that the economics and infrastructure for drone delivery are not ready yet, nevertheless they understand that delivery drones can enable and accelerate e-Commerce as well contribute to Singapore’s Smart Nation vision which seeks to harness technology to its fullest potential with the ultimate aim of improving the lives of its citizens. The official video of the SingPost drone in action can be found in YouTube. The point of view (POV) of the SingPost delivery drone during its trial flight. Max payload of 0.5 kg (1.1lbs). Max distance 2.3 km (1.4 miles). Based on the Pixhawk Steadidrone. Can fly at a height of 45 meters (148 feet) above ground. Trial flight possible due to the cooperation of SingPost, IDA, the Ministry of Transport, the Civil Aviation Authority of Singapore, the Maritime and Port Authority of Singapore, the Republic of Singapore Air Force and the Singapore Police Force. The Ukrainian postal service, Ukrposhta, has been working with the Israeli company Flytrex Aviation to test the use of drones for parcel deliveries in the city of Bucha. This appears to be a move made to complement a recent bilateral agreement made with Kazakhstan to speed up e-commerce parcel delivery between the two countries. The pilot project started the 1st of June however the program is expected to be fully up and running by 2020. Initial delivery is proposed to be made to pre-determined sites such as street corners with the payload being lowered via ropes. A video depicting the Ukrposhta parcel drone in action can be found in YouTube user Seregka1980’s account here. Concept view of Ukrposhta’s parcel delivery drone flying over Kyiv. Max payload of 3.0 kg (6.6 lbs). Max distance 23 km (14.3 miles). Based on Flytrex’s Mule drone. Conceptualized as a carbon fiber octocopter. Capable of up to 10 parcel deliveries per day. Walker Sands’ Future of Retail 2016 Study revealed 40% of the 1,400 US consumers they surveyed expect to have delivery drone options in the next 2 years and 73% stated they would be willing to pay high delivery fees of up to US$ 10, meaning people are open to the idea of delivery drones. Yet it is people who are the biggest hurdle to making unmanned parcel delivery drones a reality. Forget the challenges posed by the existing regulatory frameworks or the limitations of current technology. It is the problem of what some dub as the “problem of the last 50 feet” that is the biggest hurdle. I am not talking about the typical urban obstacles of trees and low hanging powerlines, but rather curious children and friendly dogs. 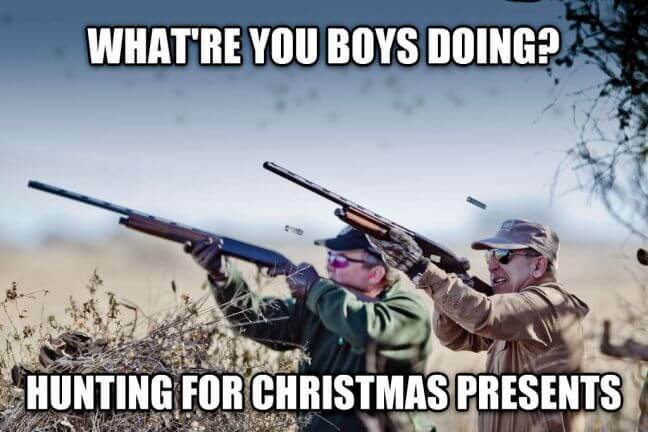 How do you keep eager consumers from cutting their fingers as they eagerly reach for their much awaited parcels before the drone has had a chance to clear the drop zone? Sure, you can roll out a landing mat a la Amazon Prime Air or use matter-of-fact warning voice commands to complement a tether delivery system like Google is planning but the fact remains that people will still have to be educated in order to avoid problems. DHL’s Skyport solution seems to be the most promising but only time will tell. At the very least the concept of “going postal” will disappear right? 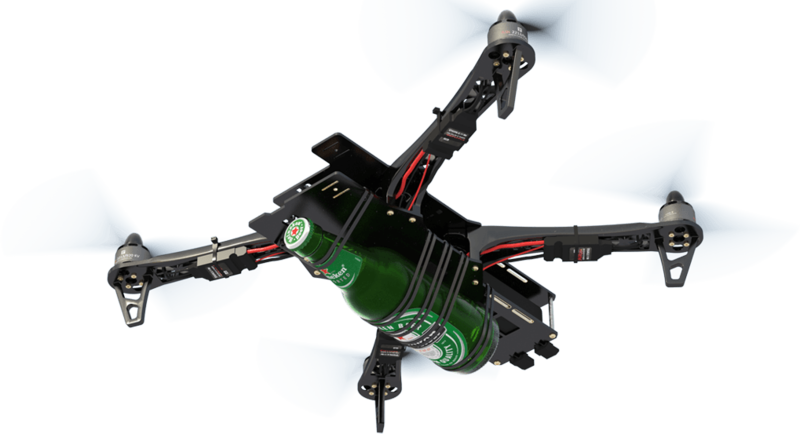 Cartoon of an NRA-approved gun-carrying drone.